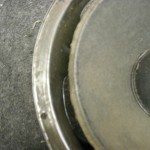 How Do I Remove the Old Foam? 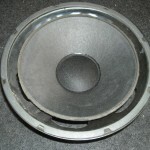 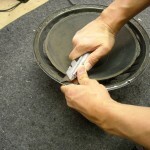 To prepare your speaker for refoaming you must remove the original parts. 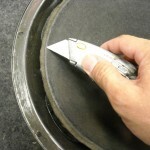 Using a utility blade, insert under the original gasket (if there is one) and circle 360º. 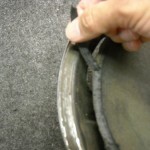 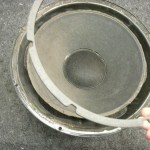 Remove the gasket and then use the same blade to scrape all parts residue from the edge of the speaker frame. 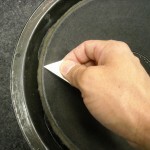 Use your thumb like a fulcrum to push the blade and keep the blade facing away from you. 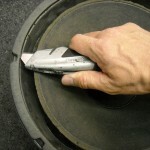 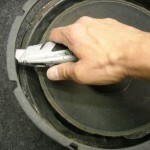 Then use the same utility blade or a straight edge razor blade to scrape the foam from the speaker cone. 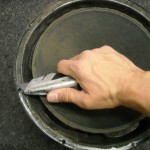 We never recommend using any solvents or other chemicals.